One of the passions that has been with me since I can remember is rockets and spaceflight. As a youth, it started with building and launching model rockets. As I settled down in Ottawa, I got more involved into rocketry culminating into building and launching very large and very high powered rockets. At that point, it became an obsession as I sunk several thousand dollars and hours into my hobby. My personal best is building a 8.5′ long 6″ diameter 1/4 scale Black Brant X for my Level 2 HPR certification. Avionics, altitude controlled dual deployment, and 640 N/s (144 lbf/s) reloadable “I” rocket engine. With the events of 9/11, the ability to do High Powered Rocketry (HPR) became difficult. Prior to 9/11 the Canadian Association of Rocketry (CAR) use to have regular launches at a Canadian Forces Base. After 9/11 CAR’s insurance underwriter pulled out and the base wanted more money, a lot more money. It became to prohibitive. Well, my obsession soon turned to new space. A slew of new aerospace entrepreneurs came onto the scene, like Roton, Virgin Galactic, Beal, etc.. My obsession became keeping up with the news in “new space”. Little did I know that a company I read about would grow into the powerhouse of innovation today. That company is Space Exploration Technologies or SpaceX, owned and run by Elon Musk. I can’t believe that it’s been 10 years since the first launch of Falcon 1 from today. Today SpaceX is launching the Falcon 9 Full Thrust, an advanced booster capable of 20 metric tonnes to Low Earth Orbit (LEO) and returning to land at the launch site. 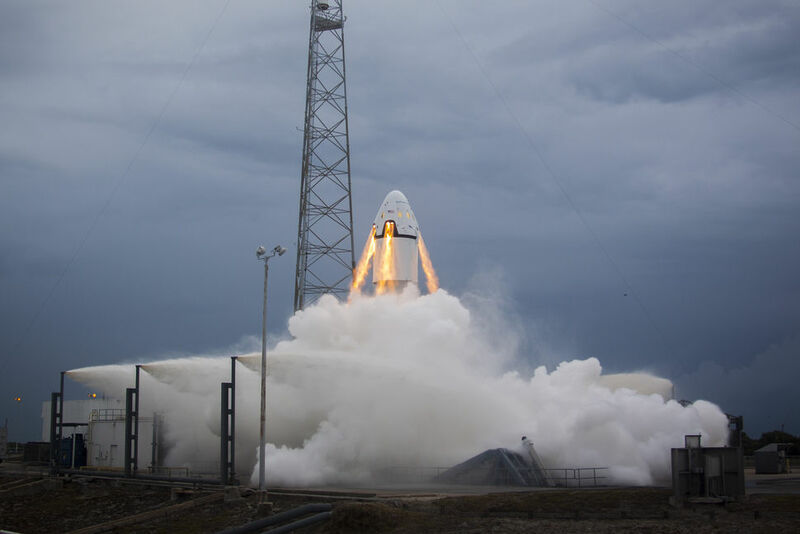 Coming within the next 1.5 years, SpaceX will be launching their Dragon 2 spacecraft capable of sending 7 astronauts to space and returning to the launch site propulsively. Also, they will be launching their Falcon Heavy on its maiden flight. A booster capable of lifting 50 metric tonnes to LEO. Obviously, my obsession has gone into warp already but there’s more. 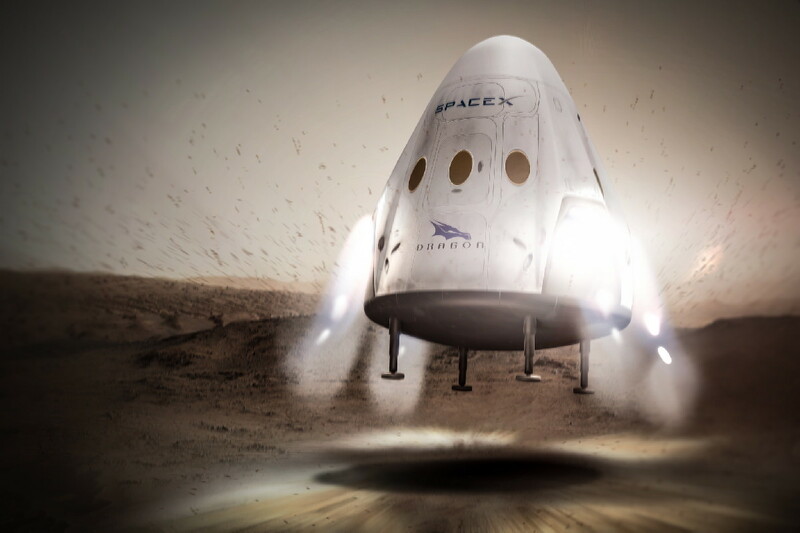 Elon Musk created SpaceX not for business but to make human kind multi-planetary. He wants to put a colony of 100 people on Mars and he’s drafting an architecture called the Mars Colonial Transporter (MCT) to do it. This architecture will be unveiled sometime this year but, of course, speculation is running rampant and I’ve got the fever myself. Based on all my reading on NASASpaceFlight.com I’ve started my own effort in speculation. Here is what I have so far. This image below is a SketchUp model of my speculation of an upper stage booster that will land on Mars and return to the Earth landing as well. The below is just the “engine room” of this upper stage. I’ll be build more in the coming time, like living quarters, etc. everything you need for Mars. The red is the Liquid Oxygen (LOX) tank and the yellow is the methane (CH4) tank. The green area represents the pressurized “engineering” space which will contain all the systems needed for a long term voyage and stay on Mars. This space will contain the Sabier reactor (produces CH4 from CO2 and H2O), cryogenic systems to keep the LOX/CH4 cool, electrical systems for power, etc.. Of course, the 4 engines are my speculation on the up and coming SpaceX Raptor rocket engine, modelled to allow long term operation in the vacuum of space and provide Supersonic Retro Propulsion (SRP) to land on both Mars and Earth (no parachutes required). Keep a watch out for updates to the model and further posts about Mars.